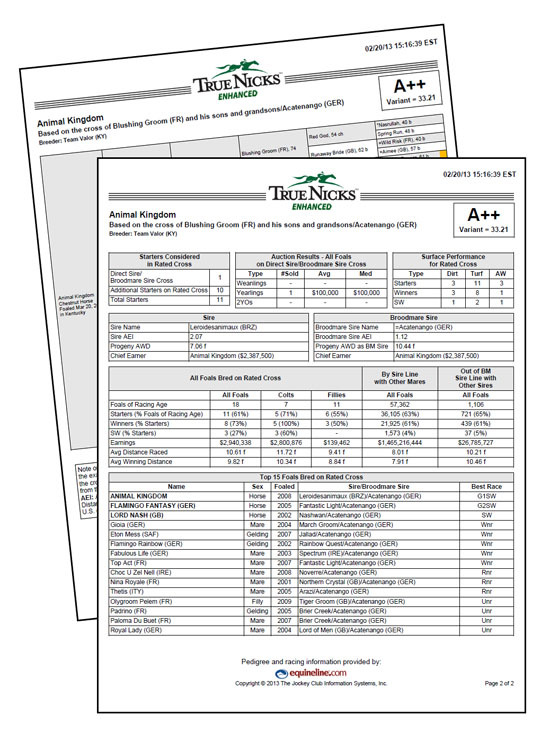 TrueNicks.com is now serving TrueNicks Classic and Enhanced reports at TrueNicks.com/Products. Reports can be ordered for any horse or hypothetical mating. Classic reports ($15) include the powerful TrueNicks rating, five-generation pedigree, and top five racehorses bred on the cross. Enhanced reports ($25) add a second page of data points for starters, auction results, surface performance, racing statistics, and the top 15 racehorses bred on the cross. Complimentary reports are always available for hypothetical matings featuring subscribed stallions. You can also find reports for auction entries at TrueNicks.com/Auctions. All TrueNicks reports feature data from The Jockey Club Information Systems, and reports are also available at equineline.com.